Jet-ski operators now occupy areas at both the northern and southern ends of Patong Beach – one area in front of the Prachanukroh Rd intersection at the southern end and another area near Loma Circle at the northern end – making the areas off limits to tourists. Patong Mayor Chalermluck Kebsup says that the jet-ski operators are occupying the sands with Patong Municipality’s permission in order to reduce traffic delays throughout the town. Under the “old rule”, jet-ski operators had to bring their jet-skis to the beach in the morning, then remove their trailers, and return again in the evening to collect their jet-skis at the end of each day, Mayor Chalermluck explained. “This causes traffic congestion each time,” she said. “We allow them to park their trailers exactly only in these areas. We do not let them park anywhere else on the beach as that would make the beach look unorganised and unattractive,” Mayor Chalermluck stressed. Signs will be posted so the public are aware that the two areas are designated for jet-ski operators to park their trailers to avoid any further confusion, Mayor Chalermluck added. 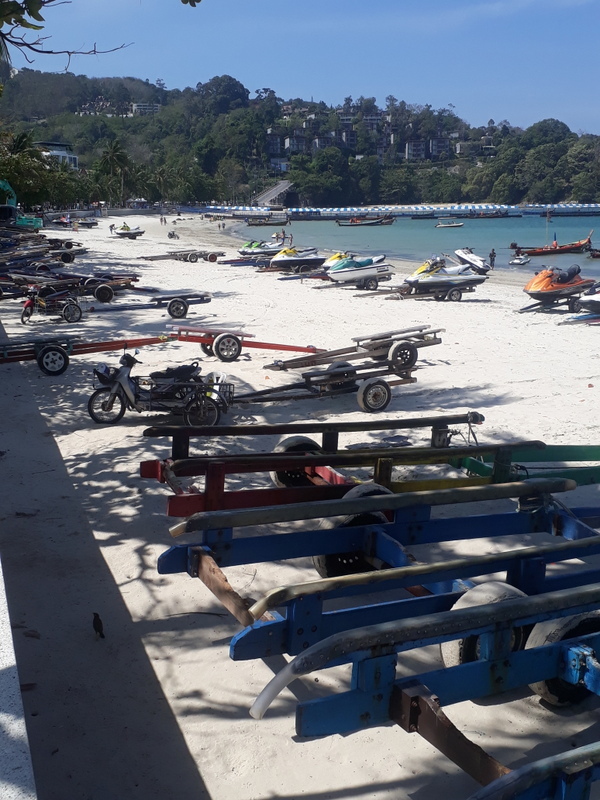 Patong Deputy Mayor Boonma Aeapsap also pointed out that each time a jet-ski trailer is hauled up from the beach, it drags sand onto the beach road, creating yet another hazard for motorists. “Dragging 50-60 jet-skis up and down onto the beach each day leaves a lot of sand on Thaweewong Rd. For the past few years, we have had to clean up that road each time. The more time we spend cleaning up just that area, the less time we have to clean up other areas in Patong,” Mr Boonma said. Mayor Chalermluck told The Phuket News that the order for jet-ski operators to vacate the sand and not to breach the “10% rule” was “just to manage it (beach occupation by vendors) at the time”. The new zones were introduced for the benefit of all people, and introduced after discussing the issue with the beach management committee, she added. The “10% rule”, introduced by the Phuket provincial government in 2015 with full authority of the National Council for Peace and Order (NCPO), mandated that beach vendors as a whole were prohibited from occupying more than 10% of sand area of any beach in Phuket. Two weeks later, soldiers following orders from Col Santi Sakuntanark, Commander of the 25th Infantry Regiment and the highest-ranking army officer stationed in Phuket were dispatched to Patong, Kata and Karon to ramp up efforts to get jet-ski operators to abide by the beach rules and no longer occupy beach sands during the day, when the beaches are to be left clear for use by tourists. “But if you see jet-ski operators’ vehicles parked in any public areas, such as the beach, please let me know (Tel: 081-6425635),” Col Santi added. In all instances, local municipalities have consistently identified the Phuket Marine Office as the leading authority on issues involving jet-skis, as confirmed by previous Phuket Marine Office Chief Surat Sirisaiyad in issuing a warning to jet-ski operators at Kata Beach in the 2017 crackdown. The same understanding was confirmed by Patong Deputy Mayor Mr Boonma, who told The Phuket News, “We don’t know which law to catch these people with. The beach belongs to the Phuket Marine Office. Everything, no matter what we do, we must ask for permission first. “The Phuket Marine Office can order or catch those people because they are the people who issue jet-ski licenses. We can help only in terms of orderliness,’’ he said. 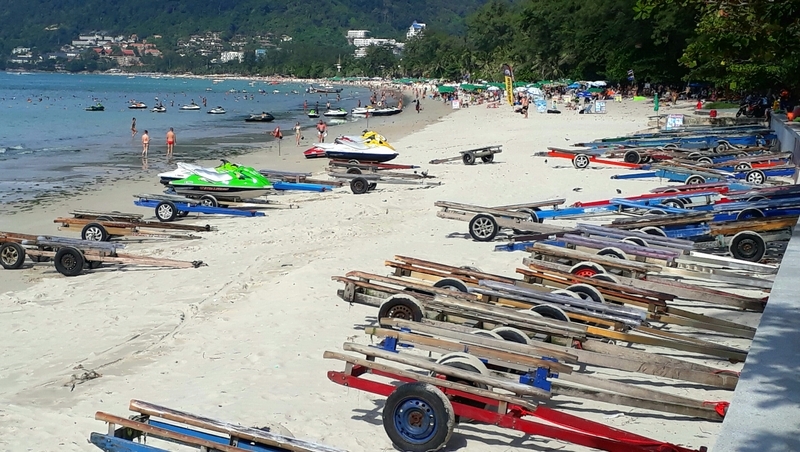 That understanding was not shared by the current Acting Chief of the Phuket Marine Office, Wiwat Chitchertwong, who told The Phuket News, “According to my duty, I repeat to every jet-ski operator to not leave any trailers on beach. “We were not involved with the decision made by Patong Municipality,” he said. Bit by bit Patong Officials restore in 2014 broken 'money lines'. Again illegal 'Cars for rent' parking on public places, tuk tuks all over illegal parking. Bars and pole dancing throughout the night, sales of copy 'branded' goods all over. Patong almost back to 'normal' as  before the 2014 Coup. Not even pretend to follow the law or regime rules any longer. You won't see that photo on the cover of any travel brochure or postcard. They love to use photos from 20+ years ago. False advertising. 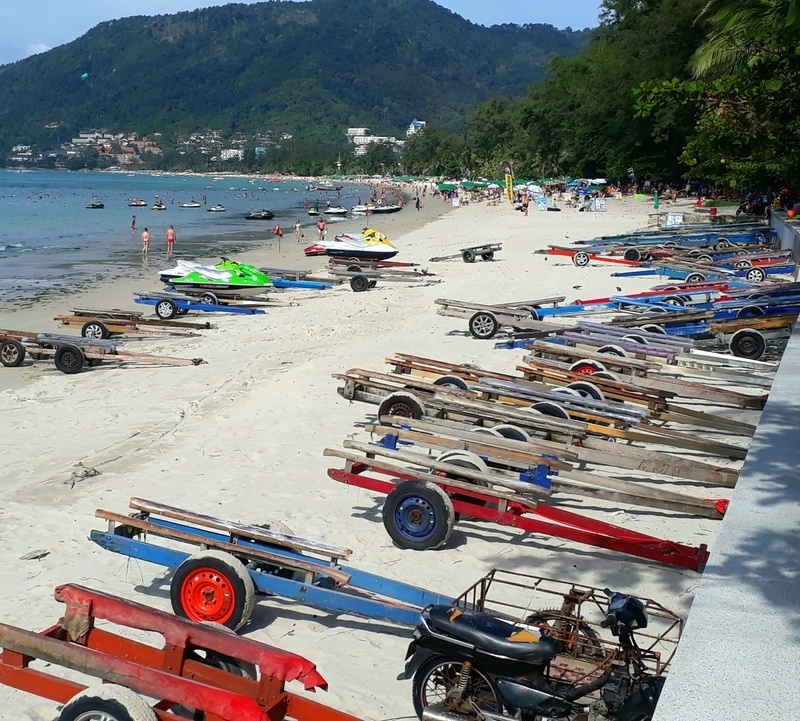 When Phuket Marine Office not enforce law it has to enforce,...No jet-skies on the beach, allowing the jet-skies 24 hours a day at beach, than I not see the need the jet-ski trailers have to be on the beach any longer if Patong Mayor not allow them to ride through Patong anymore. Remove and scrap them. Just keep 2-3 spare for 'accidents repair transport'. Orbor Tor should own and rent out. After seeing the photos of this article, can we vote what we like more in a beach? 1:beach chairs + umbrellas. 2:jet-skies + jet ski trailers. I guess they missed the bit about not running  ANY businesses on the beach. Difficult with one hand over they eyes and another held out for money. As usual one hand doesn't know what the other is doing so with muddied waters life goes on. Give them an inch and they'll take the beach, along with their cohorts preventing people parking along the beach road. What a graft-riddden shambles. No comforts for tourists like beach chairs and a cold beer, but accommodate polluting and dangerous jet ski scammers with prime beach parking for their trailers? Ignorant, foolish and corrupt. Anyway, nothing lost when this environment sett-back due to power play & brown envelops sticks to Patong Beach only, the poo-poo and pee-pee water reservoir. A bit refueling at the beach too, please. Than everything is fine again. But tourists, ..No smoking at beach! Of course, the whole problem could be resolved if a jet-skis were required to operate from s few secondary beaches tourist would travel to. All other beaches would be safer & quieter. Roads would be clear of the trailers. I guess this idea make way too much sense to actually be done. How much is she getting paid to accommodate the jet ski owners ??? How much  do they have to pay to block the public beaches every month ? Another clear demonstration of incompetence by all authorities involved. The powerful jet-ski mafia is conquering the beaches again and if a tourists erects his own parasol, he gets evicted. Are their cars then parked on beach road?